Trust humans to screw up something as monumental as the colonisation of another planet. In 2025, the first interplanetary spacecraft launched, carrying a select few intrepid explorers on course to set foot on Mars. With the planetfall successful, they could now look up in the night sky and see the tiny blue dot from whence humanity arrived on the arid, inhospitable, red soil. They struggled, but they survived. Small encampments peppered the iron oxide landscape, and eventually humans began to flourish in their permanent new home. Here, at the first true frontier of space, they also began to show their nature. The first battle of Mars began. The year was 2049, and the objective of the battle was water. Okay, so I might be dramatising here a little. But this is essentially the premise of a cool new science-themed board game I just discovered. The game is called Mars 2049. More precisely, it is the prototype of a board game, invented by a Latvian graphic designer and art director Dagnis Skurbe. This game, which to me looks like somewhat a derivation of the legendary Settlers of Catan, has one simple objective – to become the first to claim the North Pole of Mars, and build a water extraction station there. 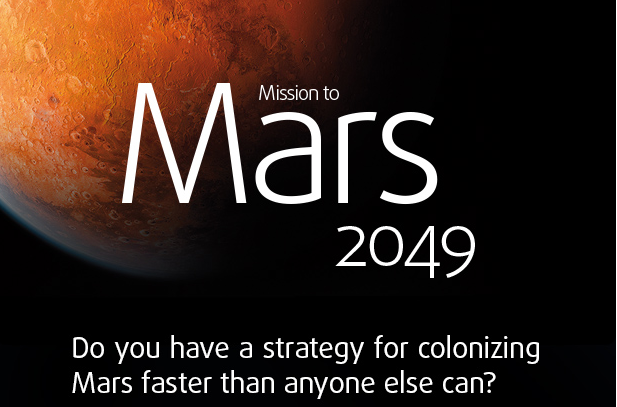 According to the backstory of the game, human colonisers of Mars simply cannot get enough water by extracting it from the soil. Hence, they need to get where “95% of the planet’s water” is locked up in a huge ice cap – the North Pole. Now, as far as the game story goes, it’s fine, and would probably make for fun gameplay. But if you were truly on Mars, chances are you wouldn’t need to trek all the way to the North Pole in order to get some life-giving water. While it is certainly the biggest single ice deposit in volume, coming in at a whopping 1.6 cubic kilometres, there are plenty of other places where you can get the water for your colonisation needs. And it is definitely not hoarding 95 per cent of all water on the planet. This is because if you need water on Mars, you must not forget the South Pole. Together with its adjacent deep deposits of ice, it is hardly smaller in volume than the other ice cap. If you melted it all, the whole planet would be covered in approximately 11 metres of water. Better yet, the soil is not that desperately dry, either. Dig up roughly 68 kilograms of Martian dirt, and you can squeeze out a litre of water. Sure, it may not be as efficient as just melting some ice, but it’s right there beneath your feet. Easy access. On top of that, there also seem to be frozen layers of ice lying right beneath the surface of the planet, known as permafrost. Just drill down and you get water. Even if the scenario of humans falling over each other in a desperate scramble for Mars water is not that scientifically plausible, it still looks like a fun board game to play. Mars 2049 is currently launched as an IndieGoGo campaign, and I suggest you go check it out.